There are times as an electrical contractor you may be certifying very similar electrical installations, a block of flats or a row of houses for instance. In these scenarios, most of the electrical certificate data will be almost identical, save for the address number and test results. It’s helpful to understand how iCertifi saves certificates to your device as opposed to sending them. Once you send an electrical certificate to your client, the PDF is generated and is locked and secure. We suggest you keep a copy of all these for your own reference. You can copy yourself in automatically by adding your email address in iCertifi Settings, or by uploading them to your prefered cloud storage provider. When you save an electrical cert to your iPhone or iPad in your filing cabinet the certificate is fully editable and uses very little space on your device storage memory. This is not really meant to be a permanent storage solution, more a work in progress folder. What has this got to do with testing similar electrical installations we hear you ask? Ok, here it is. Take an example where an electrical contractor is certifying 40 new build flats. These electrical installations are going to be almost identical except test results and address. Rather than filling out each certificate individually, let’s just use the first certificate as a template for the rest. It’s important to note this process will overwrite the previous flats certificate, however, you will already have a PDF “hard copy” if you sent, printed or uploaded Flat 1’s certificate. The sent certificate won’t change. 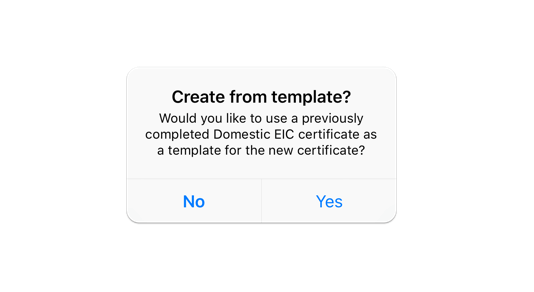 iCertifi also has a template facility that will copy any existing certificates with the exception of the DB boards if you prefer. This doesn’t simply copy everything, it leaves out all circuits and results and allows you to use existing data and create new DB arrangements and results. We hope that gives you some information to assist you when testing similar electrical installations. With 2 options you can choose which one is most appropriate for your installation.